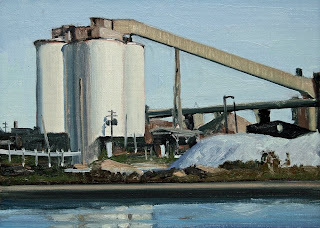 Rouge Blast Furnace #2, oil on linen panel, 7"x5"
Port of Detroit, oil on linen panel, 5"x7"
Brooklyn Bridge#10, oil on linen panel, 7"x5"
Brush Park Shadows#2, oil on linen panel, 7"x5"
Warm light and shadows on the side of a Brush Park Building. 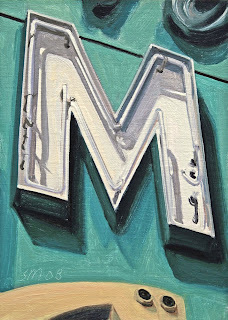 Reflections, Belle Isle, oil on linen panel, 7"x5"
Detroit Alphabet H, oil on linen panel, 7"x5"
The Detroit Alphabet "H" from the series of painting inspired by neon and vintage letters from the Detroit area. 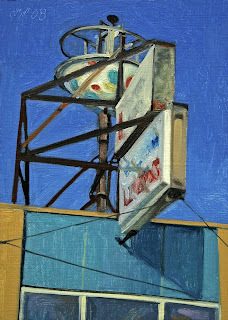 This "H" is from the window of Herman's Bakery, an excellent old fashioned bakery that has the best Rye bread and lunch sticks! 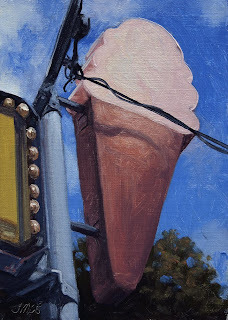 Sky Blue Pink, oil on linen panel, 7"x5"
Pink ice cream sign against a crisp cobalt blue sky. 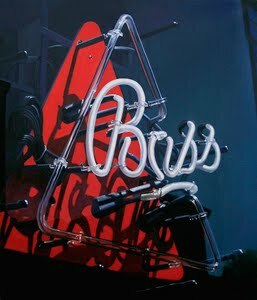 Not sure where the term came from and what it means. 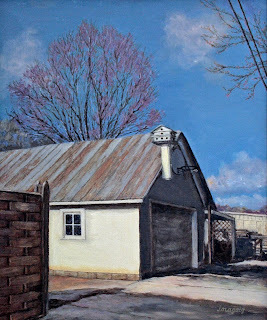 But I remember my father using the term Sky Blue Pink. 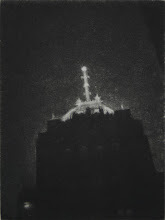 Does anyone know what it means? 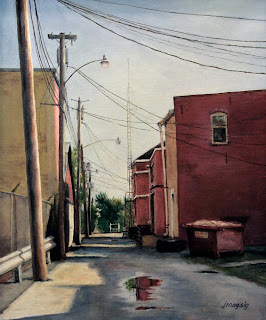 I just thought it made a great title for this painting. 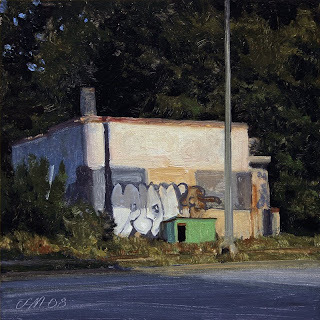 The Shadow, oil on linen panel, 5"x5"
Wonderful little building and shadow along Woodward Ave.
Woodward Ave Blues, oil on linen panel,7"x5"
Wonderful little Polka Dot sign along Woodward Ave in midtown Detroit. 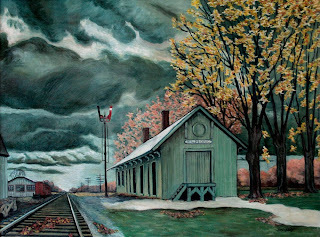 We have been having beautiful crisp, clean, and cool air this fall with beautiful deep blue skies. 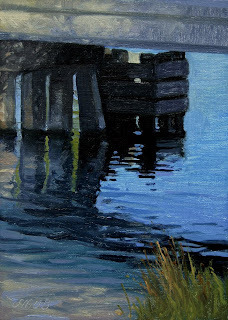 Pointe Aux Barques #3, oil on linen panel,7"x5"
The third Pointe Aux Barques painting. 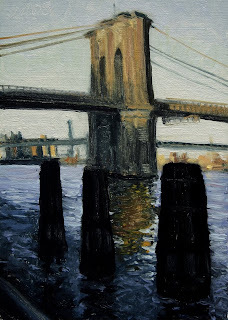 Brooklyn Bridge #9,, oil on linen panel,7"x5"
Pointe Aux Barques#2, oil on linen panel, 5"x7"
The second in a series of Pointe Aux Barques paintings. 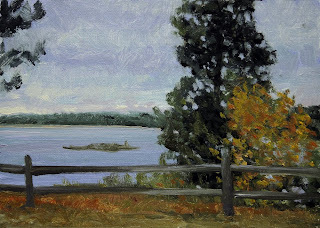 This the view from Cliff Road at the tip of the Thumb in Michigan. 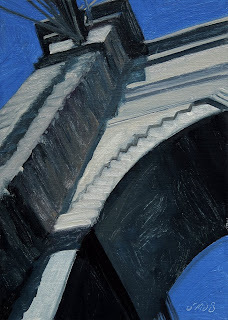 Rouge Nocturne #2, oil on linen panel, 5"x7"
The three paintings in today's post and the three in yesterday's are paintings that my Aunt, Justine Magsig painted for a show at the Elmore Public Library. 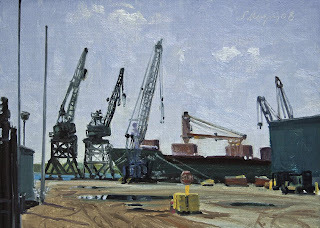 There are a few more paintings that I will post next week. 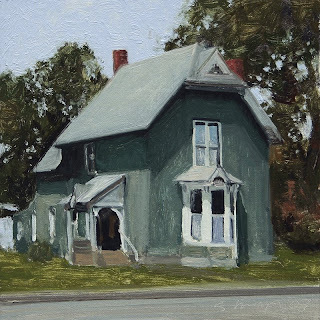 I am very proud of her and am very fortunate to have had painting instructions with her as a child and to be able to see her doing such wonderful paintings today. 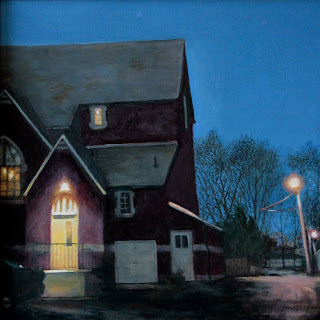 these three beautiful oil paintings are by my Aunt Justine Magsig.Those that have been following my blog know that my Aunt Justine gave me painting lessons as a child. 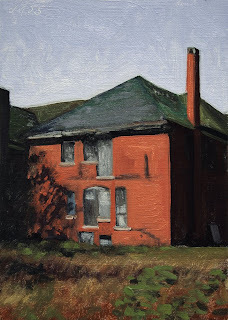 The only oil painting education I have had. 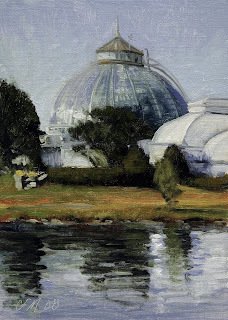 Belle Isle Reflections, oil on linen panel, 7"x5"
The third in a series of Belle Isle painting, this is the beautiful Belle Isle Conservatory. 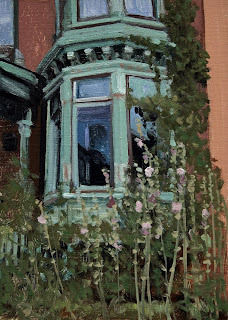 Midtown Hollyhocks, oil on linen panel, 7"x5"
A midtown bay window with late summer Hollyhocks. 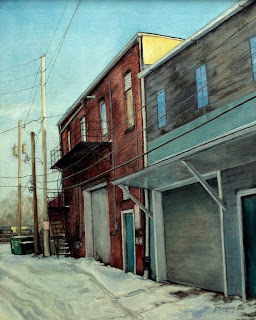 This is next door to the Cass Cafe, a nice cafe with gallery walls that has Art Shows. 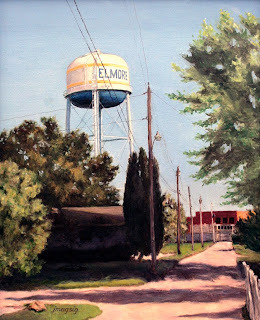 The current show is of the artwork of our artist friend Gary Eleinko. 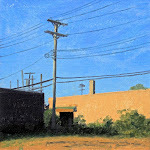 The opening is Friday September 12, 7 - 10 p.m. please stop by if you are in the area. 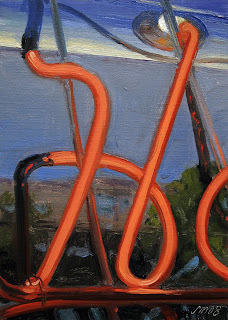 There are some wonderful works. 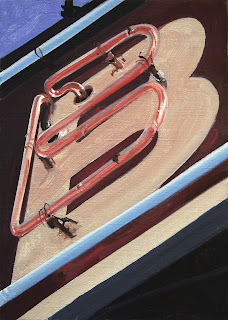 The Detroit Alphabet "B", oil on linen panel, 7"x5"
The Detroit Alphabet "B" from the series of painting inspired by neon and vintage letters from the Detroit area. 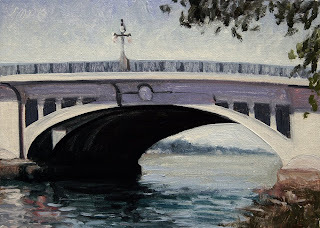 Belle Isle Bridge, oil on linen panel, 5"x7"
After doing more than 400 small daily paintings in a little over a year, I feel it's time to concentrate more on the larger gallery pieces and commissions, I plan on posting about five or six painting a week instead of seven. 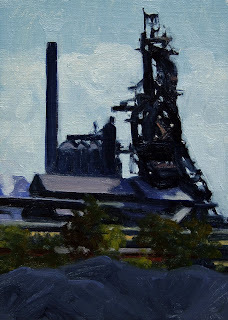 This will allow me to spend a little more time on commissions and gallery work that I am behind on. 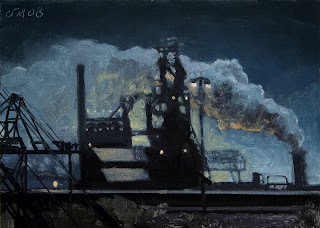 A big thank you to all the artists, friends and collectors who have been such a tremendous support and inspiration in making Postcards from Detroit such a success. 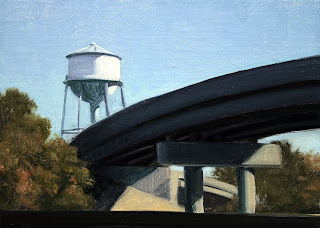 The Detroit Alphabet "M", oil on linen panel, 7"x5"
Overpass shadows, oil on linen panel, 5"x7"
We pass this watertank and overpass everytime we go downtown and I have always wanted to do a painting, here it is. 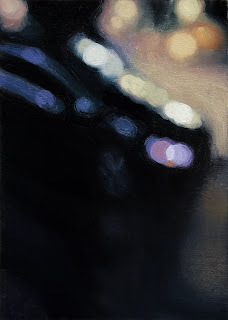 Citylights #32, oil on linen panel, 5"x7"
A dark Citylights painting, #32 of the series. 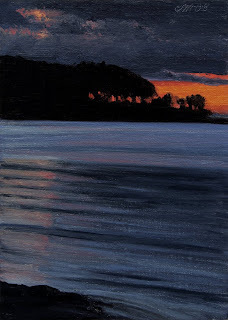 Rouge Landscape #3, oil on linen panel, 5"x7"
A midsummer Detroit nocturne with a great red flash of color. 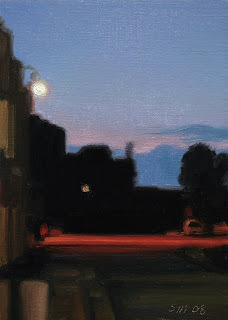 Nocturne with Red, oil on linen panel, 7"x5"
The Bay Window, oil on linen panel, 5"x5"
Once again we had a wonderful birthday party with the neighborhood children.